An absolute gem of weekend of live soccer ahead with Super Sunday the main highlight of the weekend when bitter rivals Man Utd and Liverpool clash at Old Trafford in the first instalment, and then it’s off to the Emirates where champions Man City face Arsenal. Expect two very tight games but let’s hope there are goals. Both games look nailed-on for Goalrush punters but it’s first goalscorers we like and we’re taking in-form strikers Robin Van Persie (7/2) and Theo Walcott (7/1) to open the scoring come Sunday with the double paying 35/1. On to the weekend action folks and we start in the Premiership where we have opted for a READING (2/1) win against West Brom. Brian McDermott’s improving team have not conceded in their last couple of games and will hope to build on that. We can see them beating West Brom. BOLTON (11/10) got a bit of a confidence booster last weekend when they so nearly beat Premiership team Sunderland in the FA Cup and we think they can build on that at the Reebok against Millwall. Doncaster recently lost their manager Dean Saunders to Wolves and we think that could just give STEVENAGE (17/10) the edge against the joint leaders on Saturday. BRENTFORD (11/10) are flying in League One and in a play-off spot at the moment. They can cement that place with three points away at struggling Oldham. On to the weekend draws and they are ALL in very tight affairs in the Premiership. We start at Villa Park where SOUTHAMPTON take on an ASTON VILLA side who are badly struggling and leaking goals. The Saints can leave with a point. On the subject of struggling clubs, NEWCASTLE come into that bracket as Alan Pardew’s team continue to freefall and losing top scorer Demba Ba doesn’t help. But we think they can leave Carrow Road with a hard-fought point against Norwich. On to the last draw and we head to the Stadium of Light where WEST HAM pay a visit to take on an inconsistent SUNDERLAND team. Big Sam’s team can take a point back to London in this one. Let’s get the New Year off to a winning start in the bet that won us a few pounds in the run-up to Christmas. We suggest both teams to score in the following games: Aston Villa v Southampton, AFC Wimbledon v Wycombe, Barnsley v Leeds, Bradford v Oxford, Gillingham v Port Vale and Plymouth v Morecambe. 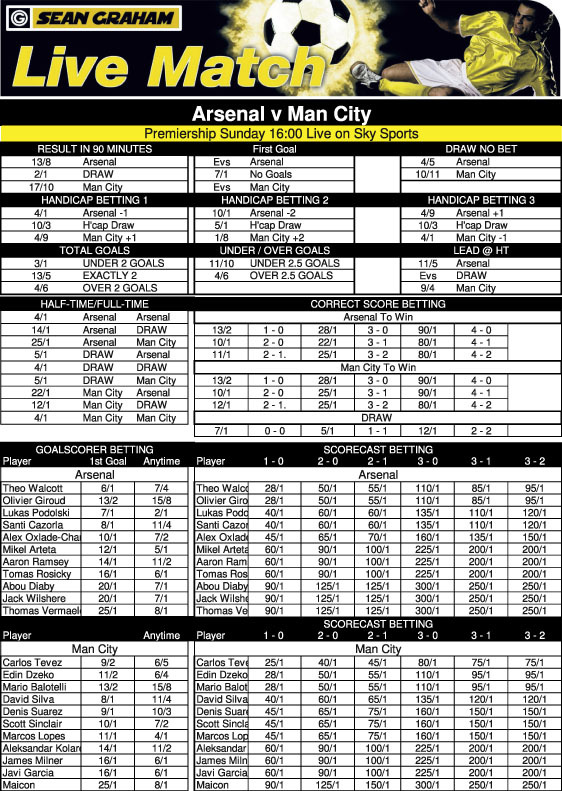 We end with the odds-on Fivehit and we start in the Premiership with EVERTON (8/13) who can bank all points against Swansea while CHELSEA (10/11) can go away from Stoke with maximum points.BRIGHTON (5/6), fresh from knocking Newcastle out of the FA Cup, can grab three vital points at home to Derby.Sheffield Utd (4/6) look too strong for Yeovil at Bramall Lane and making the Fivehit up are HULL (4/6) who can keep their promotion charge going with a win over Sheffield Wednesday in the live late kick-off. Horse Racing: The William Hill Lanzarote Hurdle and BEARS AFFAIR will take some stopping in this race. The layers think the same, making him their 5/1 favourite after his facile win at Aintree in his seasonal debut – Aruldur looks the each-way bet at 12s. Over at Warwick we have the Betfred Classic Chase which is run over a marathon three miles and five furlongs that takes some getting RESTLESS HARRY looks a great each-way bet at 12s – he will come for his last run and will relish both ground and distance.